Waterfall Schedule - 6th Grade Leopard Team Webpage! Here is our schedule for the year. 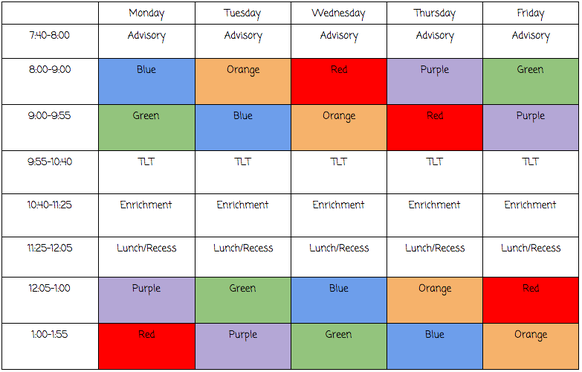 As you can see, there are 4 blocks that are everyday: advisory, enrichment, TLT, and lunch/recess. All other blocks rotate daily. We have color-coded each block for the students to know which classes they have and in what order. Everyday, the 7th block "falls" off the schedule, then appears at the top of the schedule 2 days later. For example, on Monday, 7th period is red block. It will "fall" off the schedule on Tuesday, and reappear Wednesday morning first period. Students end up having 4 classes each day along with an enrichment and TLT.